How One Teen Uses iPhone, Apple HealthKit To Manage Diabetes : All Tech Considered These are the early days of innovation that allows diabetes patients to conveniently and securely gather and share data via a smartphone. 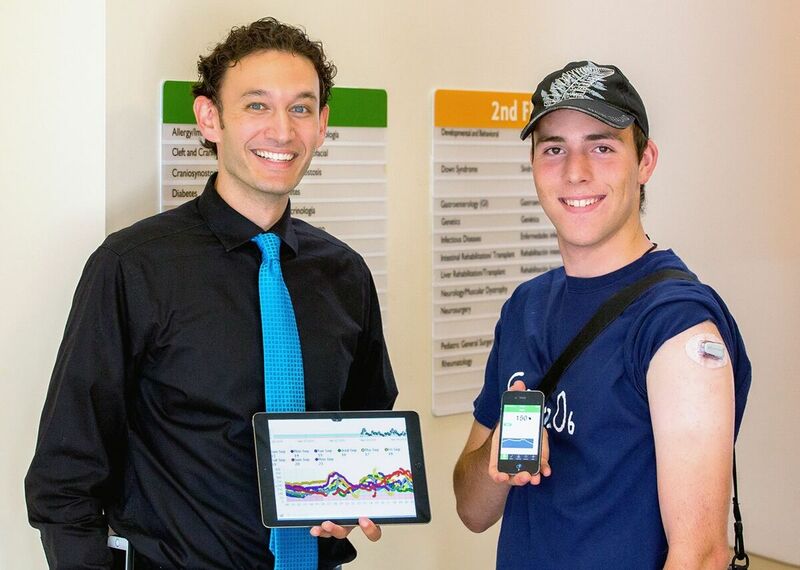 One California teenager is an early user of Apple's HealthKit. Rajiv Kumar (left), a pediatric endocrinologist, with patient Blake Atkins. The California teenager, diagnosed with Type 1 diabetes, uses Apple's HealthKit to monitor his blood sugar levels and share the information with his mother and doctor. Blake Atkins gets a lot of texts from his mother when he's at school. But unlike most teenagers, this 16-year-old doesn't seem to mind. That's because four years ago, Atkins was diagnosed with Type 1 diabetes. And now, his mother, Lori, has a way to find out and let him know when his blood sugar levels are out of the normal range. "I do like that my mom can look at my numbers," says Blake, from San Carlos, Calif. "It keeps me sane. It helps keep her sane." For people with Type 1 diabetes — and there are more than 1.25 million of them in the U.S. — monitoring blood sugar levels is a critical part of life. The traditional way involves pricking a finger for glucose testing more than four times a day and keeping track of carbohydrate consumption. Enlisting caregivers can help keep patients from getting too distracted or busy, especially with teenagers like Blake. On the tech end, devices that monitor blood sugar have existed for years. And scores of apps have cropped up to help patients manage their health and diet, keep better records and make insulin dosage less of an educated guesswork. But we're still in the dawn of the age when the readings and the data analytics can be securely collected and shared by a convenient device like a smartphone. "Families of children living with diabetes have been seeking these kinds of tools for years," says Michael Chae, Bay Area regional director for the American Diabetes Association, "and there have been people working on these solutions for some time." For years, Lori Atkins had little insight into her son's health when he left for school. She did her best to catch up in the evenings and on weekends, logging Blake's blood sugar levels and meals by hand in a notebook. Several months ago, her son's endocrinologist, Dr. Rajiv Kumar of Lucile Packard Children's Hospital at Stanford University, invited the family to enroll in a new pilot program that turns an iPhone into a tool for home health monitoring. Blake is now one of the early patients trying Apple's new health service, called HealthKit, launched in 2014 and being tested in many hospitals. A device called a continuous glucose monitor is attached to his body and uses a tiny needle just under his skin to check his blood glucose levels every few minutes. The monitor has a Bluetooth connection and, with Blake's permission, the data travel to the HealthKit data repository on his phone. From there,Blake's health information is sent to his medical record through an app that his doctor uses. Blake's mother can see his readings in real time as the designated caregiver. Kumar, if needed, also can see Blake's glucose levels with a three-hour time delay. "I usually check in on Blake's glucose levels every lunchtime when he's at school," Lori says. "He doesn't usually know or care, as it's all through the mobile phone." And Kumar can securely message Blake through the app on his side. "Last time [Blake] was sick, I wrote Dr. Kumar an email with all this data I'd manually collected and waited for a response," Lori says. Kumar says he doesn't have time to monitor a continuous stream of Blake's data. Instead, he receives a report every two weeks from the hospital with all of his patients' analyses and trends. It shows, for instance, which patients consistently have the lowest blood sugar overnight. Such analysis of a patient's blood sugar levels over time is a great first step in overcoming the major challenge for Type 1 patients and their doctors: determining how much insulin is needed and how it should be given, says Suneil Koliwad, a researcher and endocrinologist at the University of California, San Francisco. "Using technology, you can overcome the crux of the problem," says Koliwad, who specializes in treating patients with diabetes. "Mobile tools have tremendous potential to help doctors spot potential dangers that could become big problems." In fact, Koliwad says the possibility of essentially addressing a major issue with more and better data makes Type 1 diabetes something of a low-hanging fruit for major health systems. And that has attracted other technology companies apart from Apple to the task. Another major player is Alphabet, the parent company of Google. The company's life sciences division has made diabetes its first major disease target and is working on a contact lens to measure blood glucose continuously and noninvasively. One big challenge Apple and its rivals could face is time: Most doctors don't have time to pore over numbers in spreadsheets. For this reason, Koliwad says hospitals may need to invest in technical tools to present this information clearly to doctors or hire teams to monitor the data streams and respond to patients. And once doctors are on board, health systems will need to convince the patients. "From talking to other parents, I know that every teen's journey is different," Lori Atkins says. "Some kids get this burnout where they don't want to test themselves or take their insulin. Even Blake could rebel next week and stop wearing his glucose monitor." But Blake says it's unlikely that he'll give up or get embarrassed about his disease. "I don't really care what people think," he says. "Anyways, I know that the alternative is grim."